Fibromyalgia is a widespread musculoskeletal pain and fatigue disorder and the cause is still unknown. Fibromyalgia consists of muscle pain, ligament pain, and tendon pain. Essentially it is pain in all the soft fibrous tissues in the body. Patients with Fibromyalgia say that they ache all over. They feel as though their muscles have been pulled or overworked. Sometimes the muscles twitch and at other times they burn. Fibromyalgia affects more women than men and it shows up in people of all ages. Fibromyalgia sufferers often describe their aches and pains as being similar to how they feel when they have an extreme case of the flu. Every muscle in their body hurts and they felt completely exhausted. Chiropractic is an excellent treatment for Fibromyalgia. Sufferers find that proper alignment of the spine will significantly reduce the pain they feel all over their bodies. If you are suffering from Fibromyalgia don’t wait any longer to do something about it. We can help you back to health and decrease your level of pain with as little as just one adjustment. 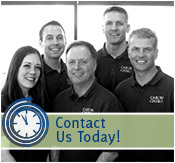 Contact our office today to schedule an appointment.